Venture Capital, Private Equity, and the Financing of Entrepreneurship stems from a realization that private equity overall - defined in this volume as venture capital and buyouts but excluding hedge funds - has become a vastly more sizable and influential part of the global economic landscape over the past two decades. The text explores the world of active investing and showcases ways of doing business in a clear and concise manner. 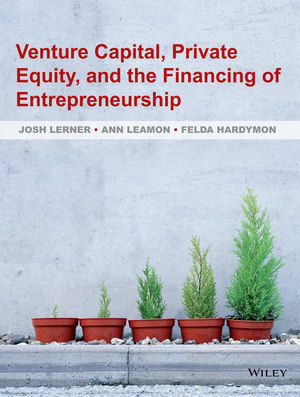 With more than 60 years of combined experience as practitioners in and/or academic investigators of private equity, Lerner, Leamon, and Hardymon explain how the fascinating world of private equity works, from start to finish, how it creates value, and where it may destroy value. Josh Lerner is the Jacob H. Schiff Professor of Investment Banking at Harvard Business School, with a joint appointment in the Finance and Entrepreneurial Management Units. In the 1993-1994 academic year, Josh introduced an MBA elective course at Harvard Business School, "Venture Capital and Private Equity," which has been consistently one of the most popular elective courses at the School, and shortly thereafter an annual executive education course on private equity. The materials from the classes are collected in Venture Capital and Private Equity: A Casebook, now in its fourth edition. Felda Hardymon is the MBA Class of 1975 Professor of Management Practice at the Harvard Business School and a career venture capitalist. He joined Bessemer Venture Partners (BVP) in 1981 and continues there as a Senior Partner. At Harvard Business School, Felda is the lead author of the VCPE Game, a large-scale, massively parallel simulation used to teach portfolio management in illiquid markets. He has served on the board of the National Venture Capital Association, where he was Chairman of the Tax Committee. Felda earned a B.S. from Rose Polytechnic Institute, a Ph.D. (mathematics) from Duke University, and an MBA (Baker Scholar) from Harvard Business School. Ann Leamon is a Teaching Fellow at the Harvard Business School. She came to Harvard after six years as a senior business analyst at L.L. Bean and three years at Central Maine Power Company as a senior economic and load forecaster. ?At Harvard Business School, Ann co-founded the Center for Case Development. She left that position to collaborate with Professors Lerner and Hardymon in the further development of the Venture Capital & Private Equity course. She holds a B.A. (Honors) in German from University of King's College/Dalhousie, an M.A. in Economics from University of Montana, where she studied urban redevelopment, and an M.F.A. in Poetry from the Bennington Writing Seminars. 6 After the Money Arrives? 10 The Impact of Private Equity on Society - Does This Really Matter Anyway? • It provides a comprehensive explanation of buyouts and venture capital -the industry that gave you Facebook, Google, Apple, Federal Express, and Skype. • It describes the incentives and motivations behind the various actors - groups that invest in funds, those that invest in companies, and the CEOs and entrepreneurs who found and run the companies. • Written by authors with a combination of more than 60 years of industry experience as academics and practitioners, it is suitable for any individuals seeking a broader understanding of the basics of this fascinating and complex industry.